Now that the walls are starting to go up on the $180 million Great Wolf indoor waterpark resort and 500-room hotel in Manteca the next challenge is for city leaders to come up with a way to coax more visitors’ dollars from the projected 500,000 annual visitors. Most of those visitors who are expected to come from the Bay Area with median households double that of families that reside in Manteca. Manteca Economic Development Manager Don Smail told the City Council last week finding a way to promote other attractions in and around the city is a high priority. It also something that the city agreed to do as part of the deal that brought the resort to Manteca that will provide 500 jobs when it opens in mid-2020 along the 120 Bypass just west of Costco. The recently approved wayfinding signs are just a part of the puzzle the city needs to piece together in the coming 13 months. Done right, the city can parlay the 500,000 annual visitors into an economic wave that could help rise local businesses including other Manteca hotels. That’s because Great Wolf is building 10,000 square feet of meeting rooms and conference space plus a 5,000-square-footan outdoor pavilion for cheer and dance competitions and similar events. Great Wolf included the meeting space primarily at the insistence from city officials who would have liked to have seen double the space. The resort chain has success in attracting conference-style business but that is not their primarily bailiwick. How effective a local effort is at helping book not just the event space as well as luring Great Wolf visitors to other attractions is an un-mined economic vein that has the ability to create a ripple effect in the local economy plus job generation as well as hotel room tax beyond the $2 million that is expected to flow into Manteca’s municipal coffers as the city’s annual share after the first full year of operation. That’s because in other markets Great Wolf representatives noted a large chunk of those attending meetings, events or conferences at their resorts don’t book rooms at the hotel, instead opting for other nearby lodging. At the same time Great Wolf corporate representatives have repeatedly noted during presentations in Manteca that guests do not spend all of their time during their stay at the resorts. Even though Great Wolf will have restaurants and non-waterpark diversions that the general public can also access, guests often will seek off-site dining options, unique shopping, and entertainment venues. It opens the door to promote everything from Bass Pro Shops, AMC Showplace 16 Theaters, Delicato Vineyards, Manteca Bowl, and the municipal golf course to niche dining options and other shopping. There is also a market that Manteca could tap into by encouraging those on more of an extended vacation visiting Northern California to tie a stay at the Great Wolf Resort in to trips to Yosemite, the Sierra, San Francisco and elsewhere. Great Wolf is also providing Manteca with a “name recognition” campaign that will make the impact of the former TV and radio ad blitzes of Manteca Waterslides and Manteca Trailer pale in comparison. Great Wolf representatives have indicated they will spend millions of dollars annually promoting the resort with Manteca being prominently used in all advertising. That said its biggest contribution is not only providing Manteca with the biggest hotel in the Great Central Valley with 500 rooms but the biggest resort. “Now we do,” Moorhead said in reference to Great Wolf. The chamber served as an incubator for the CVB before it broke off as a free-standing non-profit. Initially the CVB worked with local hotels to place visitors’ guides in rooms as well as have welcome packets for visitors with coupons to local dining spots as well as businesses. In its early years the CVB that was at the time overseen by former Mayor Steve DeBrum who served as president of the board, identified a market for corporations and organization that had employees or members in San Francisco, San Jose, Sacramento and enjoying communities as well as Fresno that wanted a central location with easy access for meetings and gatherings. The CVB tried to push that angle and was able to generate interest and some bookings but ran into issues concerning available — and adequately sized — space with support facilities such as on-site kitchens for meal service. The construction of 10,000 square feet of meeting/conference space and the 5,000 outdoor pavilion-style events center would provide a way to lure such business to Manteca given is within 60 to 80 miles of San Jose, San Francisco, and Sacramento. Smail indicated that one way to go about putting together a visitors’ bureau of sorts is to encourage local hotels to do it on their own. The city could also work with the chamber to come up with a solution. In the past the city dipped into hotel room tax — as much as $70,000 a year — to help fund the CVB. They yanked the funding three years ago after the CVB backed off on its efforts and wasn’t even maintaining a robust and up-to-date website for those interested in visiting Manteca to access to find out information about local attractions, events, dining, lodging, and nearby destinations of interest they could combine with an overnight stay in Manteca. to join the Earth Day celebration as vendors. 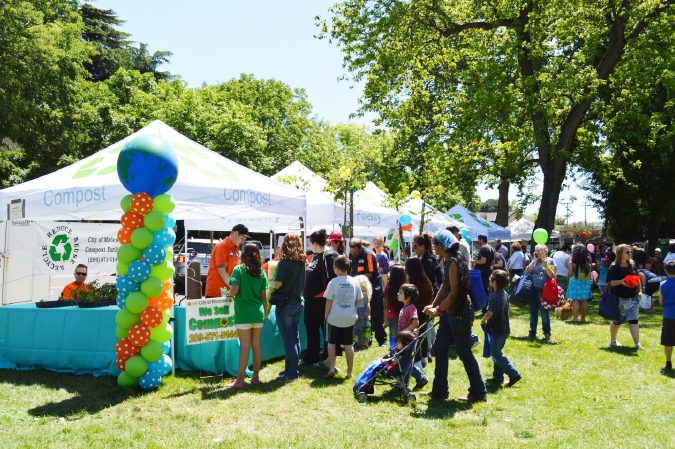 Modesto’s 30th Annual Earth Day in the Park Festival will be held from 10 a.m. to 4 p.m. on April 20 at Graceada Park, located at 401 Needham Street in Modesto. The popular free community event provides a unique opportunity to learn about the environment in a family-friendly setting. It’s an entire day of “green” education, live entertainment, fun activities for all ages, great food, and a close-up view of many non-profit agencies in the region. Interested in being part of this worthwhile event as a sponsor or vendor? Businesses and organizations with a focus on the environment that can offer green solutions to today’s environmental issues are encouraged to participate. Applications to participate can be found at www.modestogov.com or by calling the Solid Waste Office at 577-5495.
and is enjoying his new role as wine maker. The long-time wine grape grower enjoys politics but prefers being in the seat of a tractor compared to being on the floor of the state Assembly. Many passions define William Ronald “Bill” Berryhill, 61, and often they’ve run in seasons. The son of legendary state Food and Agriculture Director Clare Berryhill, Berryhill is a former California State Assemblyman, accomplished water color artist and successful wine grape grower. Today, his current passion lies in promoting his new wine. 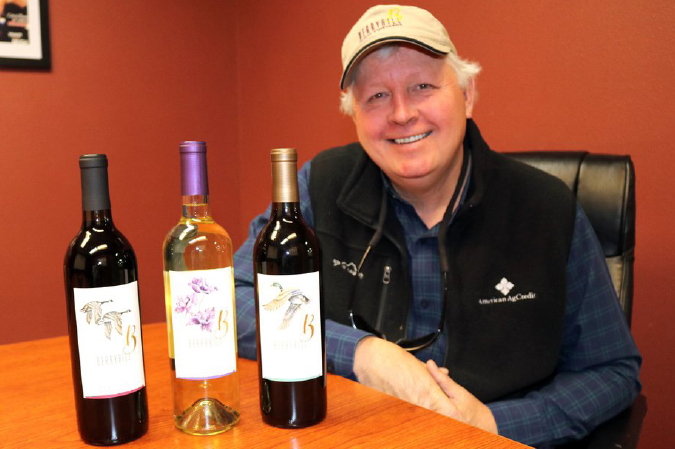 As a fourth-generation grape grower, Berryhill said it was time to “take things to the next level” in a very competitive industry. In the past, about 90 percent of Berryhill’s grapes were going to the Woodbridge Winery started by Mondovi in Acampo. About 20 years ago Bill and wife Triana bought a ranch in Clements to grow grapes for others. They still do but recently they decided to keep their operation sustainable by creating their own label. Berryhill pulls some of his stock to be processed as wine at Bob Colarossi’s Estate Crush, a custom Lodi wine press while his first-ever batch of Chardonnay was processed at a Ukiah crush facility. Using 2016 crops, the Berryhills bottled red wines for the first time this past summer – Merlots, Zinfandels and Cabernet Sauvignons. They also produce a Sauvignon Blanc and a Chardonnay. The labels on Berryhill’s bottles feature artwork from family members – including watercolor ducks accomplished by Bill and flowers painted by his great aunt Edith – as well as a short tribute to his father, the late Clare Berryhill. He has been pleased with the reception in the world of wine. His chardonnay was rated a 90 by Wine Enthusiasts magazine and a 91-rating attached to its Sauvignon Blanc. Right now, the Berryhills are knocking on a lot of doors to get the label promoted. “It’s not all that different than politics,” said Berryhill. The wine is sold at about 40 venues, including Save Mart in Ceres, O’Brien’s Markets in Modesto and Riverbank and Village Fresh Market in Turlock. The wines are served at Centre Street Grill and Bistro 234 in Turlock. For a season Bill’s life was all about politics. Born March 18, 1958 at Memorial Hospital Ceres to Clare and Maryellen Berryhill, Bill grew up fascinated by his father’s political involvement as he served in the California State Assembly and Senate before being appointed as secretary of the Department of Food and Agriculture. Bill was the youngest of five children. The oldest, Betsy Berryhill, a 1969 graduate of Ceres High School, did some stage acting and appeared uncredited in two films. Tom Berryhill, a 1972 CHS graduate who was in state politics and now a member of the Stanislaus County Board of Supervisors, was second. Next came Lynn Berryhill Trio, a 1973 graduate of CHS who died of cancer in 2018. Janie Berryhill, the fourth, graduated CHS in 1974. In 1978 Bill and Tom partnered to own and operate BB Vineyards. Bill was president of Berryhill Orchards. Determined to not always answer to Tom, Bill worked decided to take ag business courses at Butte College in Oroville in 1980. While there he got involved in student government and became politically interested. Bill became a page at the 1980 Republican National Convention in Detroit which nominated Ronald Reagan for the presidency. Bill served as the chairman of the Stanislaus County Young Republicans from 1984 to 1986. Tom and Bill pressured their dad – who was in his 60s at the time – into running for the 1989 special election to fill Tony Coelho’s unexpired Congressional term – an election lost to Gary Condit. Bill’s first run at elective office was for the Ceres Unified School District Board of Trustees in 1996. He served until 2007. Bill Berryhill represented the 26th district in the California State Assembly from Dec. 1, 2008 to Nov. 30, 2012. During the same time, Tom Berryhill had been serving in the neighboring 25th Assembly District since 2006. The Berryhills were the first brothers to serve concurrently in the California State Legislature in almost 60 years. The Republican’s exit from the Legislature occurred when he sought the state Senate seat in 2012 and was defeated by Democrat Cathleen Galgiani in a 51 percent to 49 percent margin outcome. As an outsider now and chairman of the California Association of Wine Grape Growers, Berryhill is watchful of the continual onslaught of bills out of Sacramento which adversely affect his business of growing grapes and making wine. While he is eligible to run for the state Senate, Berryhill says he has “no desire” to get back into elective politics. Berryhill is chairman of the California Association of Wine Grape Growers this year and holds membership in the Lodi Grape Growers Association and the Stanislaus and San Joaquin County Farm Bureaus. He also is a member of the Ceres Lions Club, Ceres Chamber of Commerce and the National Rifle Association (NRA). Berryhill has been a board member on the Stanislaus County Farm Bureau, 1992-97. Since 2005 he has served as a board member for the Allied Grape Growers. Construction crews work on the Foster Farms expansion in Livingston on Feb. 6. One of the largest employers in the Northern San Joaquin Valley is in expansion mode after announcing a multi-million-dollar capital investment project last week. Construction is already underway at the Foster Farms poultry processing facility in Livingston, where the plant’s product lines will be expanded and upgraded. The Livingston facility alone employs over 2,000 people in Merced County, while the company’s other plants in Turlock, Fresno, Porterville, the South and the Pacific Northwest employ an additional 10,000. 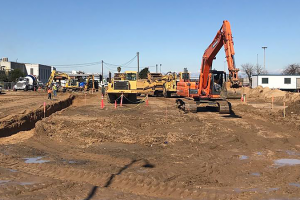 The Livingston expansion, estimated to be completed by September, will contribute additional jobs to that number, a statement released by Merced County said. “Foster Farms is expanding its Livingston operation to allow for future growth and diversification of our customer mix on the West Coast,” Foster Farms President and CEO Laura Flanagan said. Foster Farms first opened a plant in Livingston in 1959, 20 years after its founders Max and Verda Foster began raising turkeys and eventually chicks in Waterford. The Foster Farms headquarters moved to Livingston in 1960 and remain there to this day. “Since then, we have been very pleased with the quality of the workforce, the access the location provides us to California markets, and the partnership of state and local officials in helping us to succeed in California,” Flanagan said. The expansion has been made possible by a $6.5 million economic incentive package, developed by state and local government leaders working in concert with Foster Farms executive staff. The package includes resources from California Competes, the California Energy Commission Food Production Investment Program, the Merced County Expanded Subsidized Employment Program, the Merced County On-the-Job Training Program, as well as incentives from the City of Livingston. Prior to the Livingston project, Foster Farms’ most recent expansion came in 2015, when the poultry company renovated an unused chicken hatchery to expand their existing Turlock facility by 5,400 square feet. The expansion on South Walnut Road included site improvements like electrical upgrade and air handling units, as well as the installation of hatching equipment for turkeys, rather than chicken. The expansion allowed Foster Farms to increase its hatch and provide better quality poultry, or baby turkeys, while also adding 25 jobs to the local economy. It became operational in May 2016. 120 Bypass and Union Road will look like. 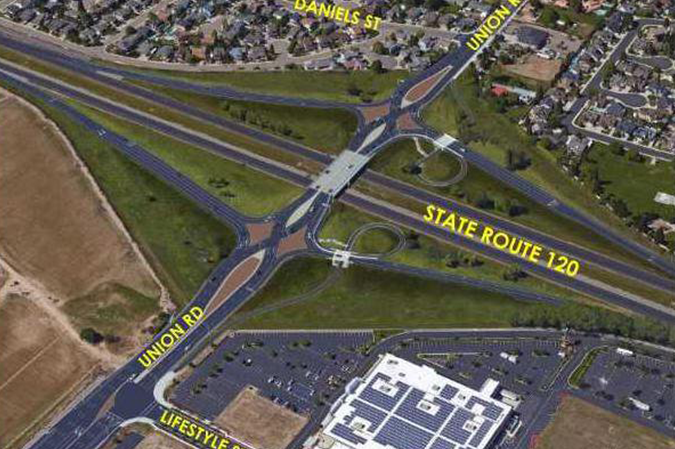 Commuters on the 120 Bypass will appreciate Manteca building California’s first diverging diamond interchange at Union Road even if they never drive across the bridge deck where travel lanes cross each other twice to improve flow and reduce the potential for accidents. That’s because the $23.7 million project includes constructing auxiliary lanes from Union Road along the 120 Bypass to both Airport Way and Main Street in both directions to allow a much smoother weave in and out of freeway traffic. Ramp metering signals will also be installed. The auxiliary lanes will help ease some of the stop-and-go congestion that plagues the 120 Bypass that is the deadliest and most accident probe stretch of freeway in the Northern San Joaquin Valley where, on average, an accident is happening almost every day. The City Council on Tuesday is expected to award a $23.7 million contract to Teichert to do the work. The four bids ranging from $23.7 million and $29.6 million came in over the engineer’s estimate of $20 million. The second lowest bid by DeSilva Gates Construction was just under $53,000 less than the Teichert bid. When the council meets at 7p.m. at the Civic Center, 1001 W. Center St., they are also being asked to award a $2.3 million contract to Drake Haglan & Associates for construction management and inspection services. That is in addition to a $604,729 contract with Mark Thomas & Company for construction staking and support services. To allow the project to go forward staff is recommending switching $2.2 million of the funds set aside to build an interchange at McKinley Avenue and the 120 Bypass as well as $1,225,000 budgeted to extend Milo Candini Drive from where it now ends at the northern edge of the Big League Dreams sports complex to Yosemite Avenue to the project. The project will also allow a left turn lane to access The Promenade Shops at Orchard Valley from southbound Union Road midway between the interchange and Atherton Drive in front of JC Penney. That would allow motorists to access Bass Pro Shops, AMC Theatres and other stores from the interior road that runs along the 120 Bypass. It also includes Manteca’s first freeway overcrossing designed exclusively for pedestrians and bicycles. A separate 12-foot wide bridge will be built to the east of the overpass with access to the bridge being via tunnels passing under off and on ramps with an ADA compliant loop leading up and down from the bridge. That will get pedestrian bicycle traffic away from the bridge deck. The separate pedestrian crossing was the result of adamant pressure four years ago from Councilwoman Debby Moorhead and the Councilman Vince Hernandez and former Mayor Steve DeBrum who were growing frustrated with pedestrian safety in Manteca. It was the same year Manteca recorded two pedestrian fatalities. Hernandez was perhaps the most passionate as he repeatedly pointed out fairly large numbers of people on foot and bicycle — many of them students — cross the 120 Bypass via bridges that have neither sidewalks, barriers separating them from traffic or fencing to prevent falls to the freeway below. Staff not only came up with the solution but was able to secure Measure K sales tax funds to pay for the separate pedestrian bridge. The fact two tunnels beneath ramps are involved prompted staff to think of possible safety concerns. In some cities where such pedestrian tunnels are in place they have become spots after dark for criminal acts and for the homeless to bed down. • Security cameras placed and protected so they can’t be damaged to provide live feeds backs to the Manteca Police Dispatch Center. • There will be extensive lighting that will also be placed and protected in a manner where they can’t be damaged. • There will be a 24-hour emergency button tied in directly to the 9-1-1 system. • It will be equipped with a device that emits continuous noise that is extremely uncomfortable to hear for an extended period of time. The diverging diamond approach was recommended by Public Works Department staff after they were tasked by elected leaders to try and come up with the most cost effective upgrade for the interchange. The only other requirement was to move larger volumes of traffic. Originally the plans called for a half cloverleaf that would have required taking nearby property including several homes. Staff looked into diverging diamond designs that were deployed in other states that were selected not for cost savings as much as it was to place interchanges that worked effectively in developed areas without taking more land and to improve safety. In the case of Manteca the design means a project price tag that was $10 million less as no additional land was needed. Also a cloverleaf style interchange would have required demolition work resulting in a longer construction frame. As an added bonus the design allows for faster and smoother traffic flow and — based on observations of diverging diamond interchanges in place — less severe collisions as well as fewer accidents. Caltrans District 10 has helped clear the way for the design that has been deployed in 80 plus other locations in the country — with the nearest being on Mona Lane in Reno. With a diverging diamond interchange the flow across the freeway has lanes crossings to the opposite side of Union Road where the ramps are and then crossing back over at the ramps on the other side of the bridge. Where the traffic crisscrosses they are traffic signals. On a traditional overpass turn movements on and off the freeway would also go through the traffic signals. That’s not the case with a diverging diamond interchange. If Union Road was improved to a partial cloverleaf interchange as was originally envisioned there would be 24 conflict points for vehicles. The diverging diamond has 12. Even more significant is the reduction in the potential for frequent T-Bone crashes that can result in extensive property damage and serious injury. There are 20 such conflicts on a traditional interchange and just two on a diverging diamond. Those two would be where the north and south lanes on Union Road crisscross. Due to the interchange’s geometry the average speed is slowed from 40 mph to 25 mph. Rep. Josh Harder’s (D-Turlock) bipartisan bill to address staffing shortages at VA hospitals overwhelmingly passed in the U.S. House of Representatives on Tuesday, March 5. During Rep. Harder’s 100 Days Listening Tour he has heard directly from veterans about how the long wait times at the VA are adversely affecting their health. This bill directly addresses this issue by creating a new pipeline of medical students who will get the training they need to eventually become VA doctors. By priming students for roles at VA hospitals, more veterans can get the care they need with shorter wait times. Harder’s Veterans-Specific Education for Tomorrow’s Health Professionals (Vet HP) Act will develop a one-year pilot program for pre-med students to gain clinical experience by shadowing VA health care professionals. Passing with bipartisan support by a voice vote, the Vet HP Act will give priority to students who are veterans, first-generation college students, or those who are intending to specialize in areas with staffing shortages. In his first three months in office, Harder has emerged as a champion for veterans. He recently passed a bipartisan amendment to support veterans experiencing mental health emergencies and has been active in pushing Congress to remove coverage barriers for Vietnam veterans poisoned by Agent Orange. In addition, Harder has established a Congressional Veterans Advisory Committee to give Central Valley veterans a voice in Washington. The Vet HP Act is also sponsored by Representatives Derek Kilmer (WA-06), John Rutherford (FL-04), and Tim Ryan (OH-13). Manteca’s part of the bargain in securing the 500-room Great Wolf indoor waterpark resort moving toward a mid-2020 opening will cost $9.4 million. That is the amount of the contract the City Council is expected to award to Knife River Construction to extend Daniels Street from where it now ends next to Costco and Big League Dreams to McKinley Avenue. The council meets Tuesday at 7 p.m. at the Civic Center, 1001 W. Center St. The contract being awarded us $1.2 million higher than the engineer’s estimate. The council is also being asked to give the city manager the authority for change orders up to 15 percent above the contract amount regarding issues with the exact alignment of the McKinley/Daniels intersection in relation to the design of the new 120 Bypass/McKinley Avenue interchange that is moving forward and the exact location of the realignment of the French Camp outlet canal that will be replaced with pipe. The city is contractually obligated through their agreement with Great Wolf to have the Daniels Street extension in place by Jan. 6, 2020. The Great Wolf project represents a $180 million private sector investment that will provide 250 fulltime jobs and 250 part-time jobs. The city will use part of the remaining redevelopment agency funds set aside for the South Area Regional Infrastructure Project to pay for the work. After the Daniels extension is paid for that will leave less than $5 million in the RDA account. The extension work will include all utilizes, sidewalks, curbs, gutters, landscaping and traffic signals at Daniels Street and the main entrance to Great Wolf Lodge. The Daniels Street extension will also open up more city-owned land for developed as a family entertainment zone generally north of the street extension’s alignment and the municipal wastewater treatment plant. 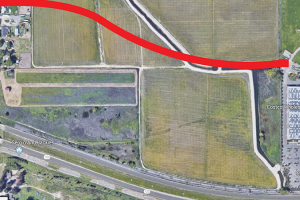 The city is also moving toward groundbreaking on adding a fourth interchange to access Manteca from the 120 Bypass at McKinley Avenue. That interchange will serve growth south of the 120 Bypass as well as a massive Lathrop employment center that will abut McKinley Avenue. It is also needed if Great Wolf exercises an option on city land to add up to 300 more hotel rooms. The biggest new traffic generator in the area, however, is likely to be the city’s FEZ being designed to pursue regional dining and entertainment draws to pull patrons from Tracy, Modesto, and Stockton as well as Manteca, Lathrop, and Ripon. until the second phase takes it to Turlock and Merced by 2026. 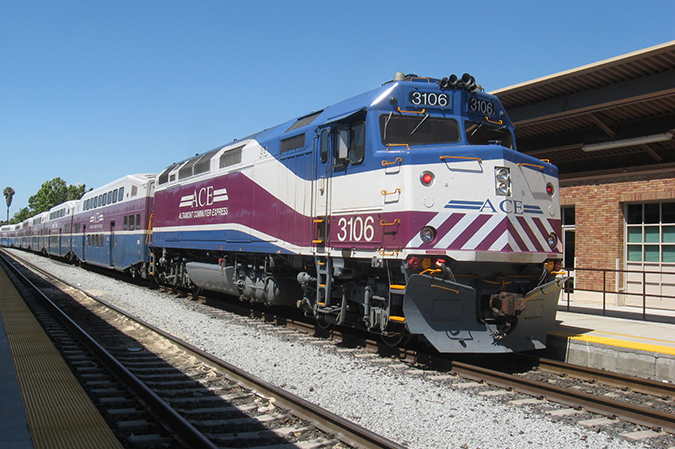 Stanislaus County is preparing for the Altamont Corridor Express train and the access it will provide to Bay Area locations for commuters and visitors alike. The city of Ceres plans to embark upon safety improvements in the Whitmore Park and El Camino Avenue area in anticipation of a planned ACE train platform. City officials are anticipating Ceres getting a station when the ACE train line is extended as far south as Ceres in the first phase. Currently the train runs four trips per day between Stockton and the Bay Area but plans call for an extension to Ceres with stop platforms in downtown Manteca, Ripon, Modesto and Ceres. A platform will be constructed in Ceres between the southbound lanes of Highway 99 and Railroad Avenue which will be accessible only from the east side of the freeway. Users would park in a yet-to-be built parking area along the wall of the raised part of the freeway and walk underneath the existing overpass. The city intends to add safety lighting this year. That funding will pay for a parking area and improvements to the undercrossing under the freeway and the platform. If the UP doesn’t permit ACE access, the process requires the building of a new rail crossing over the Stanislaus River and all the environmental review process that accompanies it. That would likely delay ACE’s arrival to 2023. Modesto would also get an ACE train stop at the existing transit station on Ninth Street. Ceres would be the end of the southern extension until the second phase takes it to Turlock and Merced by 2026. Until a Merced line is extended, riders will be able to ride to Ceres and take a bus to Merced. During the interim when Ceres is the farthest point south, evening trains will be stored at a layover facility south of Service Road near the grain towers. The temporary layover facility in Ceres would discontinue pending the completion of the extension to Merced and a permanent layover facility in Merced. The California economy should maintain strong growth through 2019 despite an uncertain political environment and financial market volatility, according to the latest projection from the Center for Business and Policy Research at the University of the Pacific in Stockton. California’s record low unemployment rate is projected to stabilize at 4.0 percent through 2020 before gradually increasing. California’s rate of economic growth is forecast to grow at a 2.9 percent rate for the next 12 months, and fall below 2 percent by 2021 as recession risks grow. The regional outlook projects Sacramento to lead Northern California in job growth in 2019 after lagging slightly behind the rapid growth seen in the Bay Area, Stockton, and Merced in recent years. Sacramento’s government and healthcare based economy should sustain, if not accelerate, growth in 2019 as most other Central Valley areas gradually slow with the broader California economy. Forecasters also project San Francisco and San Jose to sustain over 2 percent job growth in 2019 despite the region’s housing constraints and unemployment averaging below 2.5 percent. This is partially due to increased commuting from inland areas, but also because skilled-workers are displacing others from the Bay Area’s housing stock which allows the region’s skilled workforce to grow significantly faster than population growth. In addition to the detailed economic forecast for California and eight Northern California metropolitan areas, the forecast discusses Governor Newsom’s agenda including his recent announcement to downsize the costly and controversial megaprojects championed by Governor Brown: California high-speed rail and the Delta water conveyance tunnels. The full forecast can be downloaded from the Center’s website at Pacific.edu/CBPR. The Center for Business and Policy Research at the University of the Pacific was founded in 2004 and was known as the Business Forecasting Center until March 2015. The Center is a joint program of the Eberhardt School of Business and the McGeorge School of Law programs in public policy and has offices at the Sacramento and Stockton campuses. The Center produces economic forecasts of California and eight metropolitan areas in Northern and Central California, in depth studies of regional economic and policy issues, and conducts custom studies for public and private sector clients. For more information, visit Pacific.edu/CBPR. Growing consumer spending at restaurants has fueled rapid growth in the Leisure and Hospitality sector. This sector has added up to 75,000 jobs in recent years, but projections are for just 10,000 to 15,000 new jobs in each of the next few years as rising labor costs and low labor availability drives change in the hospitality sector. State and local government employment experienced solid 2 percent employment growth from 2014 to 2017 as public budgets, especially in education, recovered. However, state and local government hiring will drop below 1 percent for the next several years in spite of revenue growth as these entities grapple with slower revenue growth and rising pension costs. Construction jobs have been growing rapidly in recent years as the hard hit sector continues to recover. Expect a slight slowdown in construction job growth in 2019, about 30,000 new jobs compared to as much as 50,000 in recent years. Job growth is limited by worker availability and little expansion to residential construction in 2019. Single family housing starts are projected at 66,000 in 2019, about the same as 2018. Multi-family production is also projected to be flat in 2019 between 45,000 and 50,000 new units. After 2019, expect total new housing starts to gradually grow another 10 percent and stabilize at just over 125,000 total new single and multi-family units per year. California’s population growth is projected at about 0.5 percent for the next several years, at or near a record low growth rate. California’s population is still on track to reach 40 million this year prior to the 2020 census, and should add about 200,000 new residents per year. The FBI is seeking to identify businesses that may be victims of an alleged nationwide workers’ compensation insurance, health care insurance, and pension plan fraud scheme. On Jan. 10, American Labor Alliance and two of its executives were charged with mail fraud, conspiracy to commit mail fraud, and money laundering by a 14-count federal grand jury indictment. Court documents allege ALA and its subsidiaries sold what was purported to be workers’ compensation coverage that, in actuality, may offer no coverage. From at least 2011 onward, ALA offered what it purported to be a retirement pension plan to its clients, known by a variety of names including “ALA Trust,” the “ALA Retirement Plan Trust,” or the “ALA Retirement Plan and Trust,” that may also be invalid. According to court documents, ALA and its affiliates allegedly purported to offer a broad range of financial services to potential clients, including tax preparation and drafting of incorporation and other documents. It fraudulently marketed itself as a special type of labor organization under federal law and advertised that its customers could join ALA and receive financial services. Businesses that purchased policies from American Labor Alliance or one of its many subsidiaries nationwide should contact their state insurance regulator to ensure the validity of their policies. If you believe you/your business may have been a victim of this alleged fraud, please call 1-800-CALL-FBI or send an email to WCVictims@fbi.gov.